A gear train is two or more gear working together by meshing their teeth and turning each other in a system to generate power and speed. It reduces speed and increases torque. To create large gear ratio, gears are connected together to form gear trains. They often consist of multiple gears in the train. The smaller gears are one-fifth of the size of the larger gear. Electric motors are used with the gear systems to reduce the speed and increase the torque. Electric motor is connected to the driving end of each train and is mounted on the test platform. The output end output end of the gear train is connected to a large magnetic particle brake that is used to measure the output torque. Simple Gear Train - The most common of the gear train is the gear pair connecting parallel shafts. The teeth of this type can be spur, helical or herringbone. The angular velocity is simply the reverse of the tooth ratio. The main limitation of a simple gear train is that the maximum speed change ratio is 10:1. For larger ratio, large size of gear trains are required; this may result in an imbalance of strength and wear capacities of the end gears. The sprockets and chain in the bicycle is an example of simple gear train. When the paddle is pushed, the front gear is turned and that meshes with the links in the chain. The chain moves and meshes with the links in the rear gear that is attached to the rear wheel. This enables the bicycle to move. 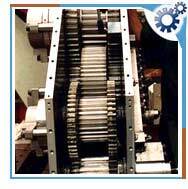 Compound Gear Train - For large velocities, compound arrangement is preferred. Two keys are keyed to a single shaft. A double reduction train can be arranged to have its input and output shafts in a line, by choosing equal center distance for gears and pinions. Epicyclic Gear Train - It is the system of epicyclic gears in which at least one wheel axis itself revolves around another fixed axis. Planetary Gear Train - It is made of few components, a small gear at the center called the sun, several medium sized gears called the planets and a large external gear called the ring gear. The planet gears rolls and revolves about the sun gear and the ring gear rolls on the planet gear. Planetary gear trains have several advantages. They have higher gear ratios. They are popular for automatic transmissions in automobiles. They are also used in bicycles for controlling power of pedaling automatically or manually. They are also used for power train between internal combustion engine and an electric motor. Gear trains are used in representing the phases of moon on a watch or clock dial. It is also used for driving a conventional two-disk lunar phase display off the day-of-the-week shaft of the calendar.